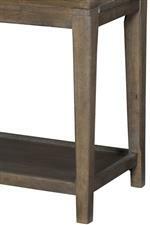 Crisp vertical and horizontal lines pair with an open design to create a handsome contemporary style in this console table. A fixed open shelf provides you space to show off an accessory or a few books while two spacious drawers add valuable concealed storage to your living room. Black drop pulls offer a contrast to the medium brown finish to create a gorgeous piece. The Park Studio Contemporary Console Table with 2 Drawers by Hammary at Jordan's Home Furnishings in the New Minas, Halifax, and Canning, Nova Scotia area. Product availability may vary. Contact us for the most current availability on this product. Storage Two drawers and one open shelf provide display and concealed storage. Drop front wire management on the right side drawer.